Walking on thin ice on Rainy Lake, in the northern reaches of Minnesota, it's more than a saying. And for Owen Jensen, nineteen and suddenly responsible for keeping his mother and five brothers alive, the ice is thin indeed. Ice-Out returns to the frigid and often brutal Prohibition-era borderland of Mary Casanova's beloved novel Frozen, and to the characters who made it a favorite among readers of all ages. Owen, smitten with Frozen's Sadie Rose, is struggling to make something of himself at a time when no one seems to hold the moral high ground. Bootlegging is rife, corruption is rampant, and lumber barons run roughshod over the people and the land. As hard as things seem when his father dies, stranding his impoverished family, they get considerably tougher--and more complicated--when Owen gets caught up in the suspicious deaths of a sheriff and deputy on the border. 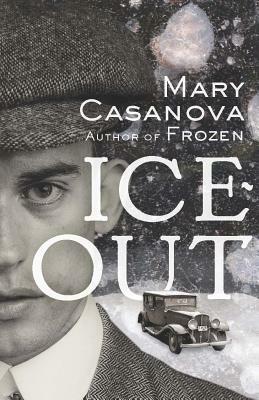 Inspired by real events in early 1920s Minnesota, and by Mary Casanova's own family history, Ice-Out is at once a story of young romance against terrible odds and true grit on the border between license and responsibility, rich and poor, and right and wrong in early twentieth-century America. Mary Casanova is author of more than thirty books for young readers, ranging from picture books, such as Utterly Otterly Night and Wake Up, Island (Minnesota, 2016), to novels, such as Moose Tracks (Minnesota, 2013) and Frozen (Minnesota, 2012). Her books are on many state reading lists and have earned the American Library Association Notable Award, Aesop Accolades from the American Folklore Society, Parents' Choice Gold Award, Booklist Editors' Choice, as well as two Minnesota Book Awards. She speaks frequently around the country at readings and library conferences. She lives with her husband and dogs in a turn-of-the-century house in Ranier, Minnesota, perched on the Canadian border.